Faber Piano Adventures. Educational, Method. Softcover. 48 pages. Faber Piano Adventures #FF1076. 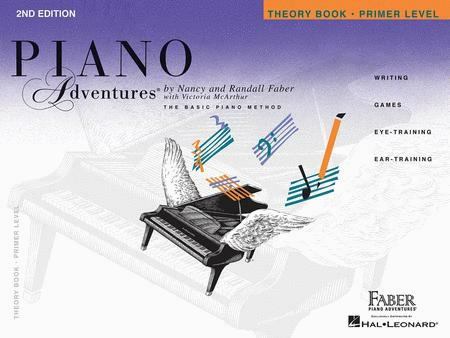 Published by Faber Piano Adventures (HL.420169). The 2nd Edition Primer Theory Book provides important reinforcement and creative application of basic theory concepts. Students will enjoy note-naming with StoryRhymes, exploring improvisation, and engage with eye-training and ear-training activities – all within a fun-filled context tied thematically to the Primer Lesson Book pieces. my students had to get the 2nd edition because it just wouldn't be compatible. I've also had to rewrite all my lesson plans, so be prepared to spend some time doing that. 45 of 85 people found this review helpful. and G need to work on his improvision!? They don't need to be taught how to bang on the keys. Also, I feel they tried to 'modernize' with more graphics but they are simply overwhelming. I'm not looking for a picture book, just the old, wonderful, straightforward theory book. BRING BACK THE FIRST EDITION! 71 of 125 people found this review helpful. October 09, 2008 Super Simple to use! WOW!! We are amazed at this book! 92 of 196 people found this review helpful. "games" over and over. I've taught 33 years and I'm glad my students like doing these theory books. 99 of 179 people found this review helpful.